SaaS providers must understand the difference between consumers of their apps, producers of SaaS network effect data and how to monetize both. A quick update for 2013: ADP now processes payroll payments for 1 in 6 American workers. Because of this massive “network effect” they’ve created, ADP has unprecedented, real-time visibility into America’s workforce; the ability to find answers in a way no large-scale poll could ever hope to achieve. ADP recognized that, while there payroll processing services were valuable as a revenue stream, what made ADP super-valuable as an entity, was the network effect data and the ability to report on it in aggregate. ADP is now the trusted source for US Employment Statistics and Trends, with Hiring Managers and HR departments, Media Outlets, and even Federal and State Governments hanging major hiring and policy decisions on what ADP says. ADP isn’t a SaaS or Cloud company… ADP is a data company, and has used that to position themselves as not just a business resource for their customers, but an INVALUABLE resource to the United States of America. Not a bad position to be in! First of all, lets be very clear: its not exploitation and these revenue streams are not hidden. 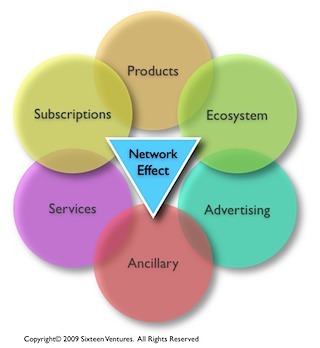 SaaS network effect data (AKA data exhaust, aggregate application data, etc.) is based on the position of the SaaS vendor as a proxy in a multi-tenant environment and the value that is created by the network effect data can be quite significant when leveraged correctly; both for the vendor and the ecosystem. I realize that journalists or analysts attacking providers for “exploiting” SaaS network effect data are just spreading FUD to either push a personal agenda or – more likely – as link bait. Either way, I feel that I have to defend the rights of the SaaS vendor from these negative attacks, and maybe generate a bit of link bait myself. Moreover, I also need to remind my clients, readers, and followers that these folks are just spreading FUD and that leveraging – not exploiting – SaaS network effect data, is potentially a critical piece of the value derived from being a SaaS vendor. Many SaaS and Cloud vendors I’ve worked with have had that “ah-ha” moment when they realize for the first time they aren’t a technology company or a software vendor… they’re in the Data and Information business! Finally, I need to remind the users of SaaS that a credible, trustworthy vendor will leverage the SaaS network effect data in a way that provides value to you in a way you could never have expected from Legacy Software. The problem with SaaS network effect data is that, just like SaaS itself, it is mis-understood. For example, too many SaaS vendors consider the de facto revenue model in SaaS to be monthly subscriptions, which is not only untrue, but limits the potential of the SaaS vendor substantially. Note the inclusion of Healthcare in there; an industry with tight privacy laws (not just industry suggestions, but laws). All of these industries have been trading in data like this for years. As a SaaS provider, you need to ensure you comply with the proper laws and industry governance and make the right ethical decisions, but anyone who makes a blanket statement that leveraging network effect data by a SaaS vendor is “exploitative” or otherwise inappropriate is simply trying to stir the pot by being “edgy” or is, even worse, incentivized to spread FUD. When I wrote this in 2009, most SaaS providers didn’t consider leveraging SaaS network effect data as a viable revenue stream, mostly because they didn’t understand what they had at their fingertips. Companies coming to market in 2013 not only recognize the value in network effect data, but have taken advantage of the Big Data movement to build in the proper mechanisms to fully leverage what they have. In fact, SaaS companies that came to market in 2009 (or earlier) and didn’t recognize this often failed to build into their system adequate data capture methods in the first place, which prevents them from leveraging network effect data in any meaningful way. Now in 2013 they’re struggling to retrofit their architecture to take advantage of the network-centricity they’ve had for the past 5 years. If only they would have listened to me back then. These are things that need to be considered during the early phases of product development, even if you won’t be able to fully monetize for a long time. In fact, how long it will take to get to a point where you can derive revenue from SaaS network effect Data is something that is 100% unique to your business. When I work with clients, I leverage our proprietary SaaS Revenue Matrix to get past the false notion of “critical mass” for SaaS network effect data value and get to the real story of how you can profit – literally and figuratively – from Network Effect data. For immediate consultation and advice on leveraging Network Effect data to scale your SaaS business, schedule a 60-minute meeting with me via Clarity. If you feel a more involved engagement is required for me to help you, email me with the specifics of your situation (as much detail as you’re comfortable giving) and we’ll setup a meeting to work through the particulars. Web Apps don’t get forked without a massive payday as motivation! It was announced this week that the United States government wants to use Google Docs but had some security concerns. Google said they will overcome those concerns by building a private “cloud” to meet government requirements. This is probably a pretty good deal for Google, but it is not the way they normally operate. In fact, would they do this for a smaller customer with similar privacy or security concerns? No. They’d tell them to go find someone else who will break their model for them. The government wanted Google to break their model and to Google, the deal was big enough that it made sense. The government broke the model, and they bought it. SaaS is a Business Architecture, not just another way to deliver software; at least when implemented correctly. People will always want you to make an exception for them, but as I posted yesterday, SaaS is about rules, not exceptions. We’ve all seen the sign in an antique store that says “if you break it, you buy it.” As SaaS vendors, especially early-stage companies looking for any and all deals, we need to plaster this message around the office (unless you “office” at Starbucks… just make your Mac OS background say those words). When presented with an “opportunity” to do something beyond the model you have chosen, remember those words and tell anyone who will listen “If you want me to break the SaaS business model, then you will have to pay a premium for that.” As a SaaS vendor you need to cover the risk associated with the increase in overhead due to a decrease in operational efficiency, the need to maintain separate source code forks, etc. You also need to be compensated for the hit to the other revenue streams derived from the Network Effect and Ecosystem that are now not available to you by this new arrangement. The Network Effect and Ecosystem provide two of the most important Revenue Streams for a SaaS vendor and when you cannibalize these due to early mis-steps – like breaking the SaaS business model for a quick buck – you will miss out later on; potentially when it really counts. The risk to your business is too high to make these decisions on a whim. Don’t let the temptation of a large cash influx now hurt the overall growth potential of the business. Too many SaaS vendors are met with this dilemma early on. Those that make it stick to their guns and stay on course or, if pressed, set limits on the one-off deals they’ll do and of course, make those who break it pay a premium. I’ve seen many vendors get stuck supporting a handful of early one-off customers because they made some bad choices. These bad choices caused the businesses to stagnate and, in more than a few cases, fail. SaaS Apps should be flexible, but never customized. For the vendor, the SaaS business model is about rules, not exceptions. Exceptions aren’t scalable. For business scalability, you must shift focus to automated, repeatable processes. For pure-play SaaS startups, this isn’t as big of deal since they are likely starting with a clean slate. For those “switching” from the legacy software model or branching out from a non-software company by exposing internal processes, products, or expertise to the market via SaaS, this can be a big challenge. Whereas much of your current revenue might come from professional services, other one-off services, customizations, etc., if you draw the line in the sand and say “we are a SaaS vendor”, then you need to do whatever it takes to derive most of your revenue from the rules, and not the exceptions. The rules in the SaaS business model are the scalable revenue streams, and the exceptions are not. To do this requires you to identify and clearly delineate the revenue streams available to you (there are 7 total) and to architect your business, including the underlying software, to drive toward the scalable revenue streams. This could also require you to completely change your business and operating environment (the technology is the easy part); are you ready?